The weather is grey and your mood is blue. It starts to rain. You step outside in the first downpour of the season, after a long dry spell: the sweet, fresh, earthy smell of rain just lifts up your spirits. The aroma makes you feel happy and rejuvenated. The smell of rain has its own scientific name – ‘Petrichor’. The word derives its ethereal essence from the Greek mythology- ‘PETRA’- which means stone and ‘ICHOR’ – refers to the fluid that flows like blood in the veins of the Gods. 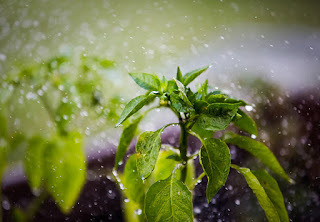 – Back in 1964, a pair of Australian scientists (Isabel Joy Bear and R. G. Thomas) began the scientific study of rain’s aroma in earnest with an article in Nature titled “Nature of Argillaceous Odor.” In it, they coined the term petrichor to help explain the phenomenon. The plants produce certain oils such as Palmitic acid and Stearic acids, particularly when there is a relatively long spell of dry weather. These are produced to inhibit growth and minimize competition for water. These oils collect in the soil and in rocks; rain then causes a range of smaller, volatile compounds to form within them. When a raindrop hits a porous surface it traps tiny pockets of air. These bubbles then speed upward, like bubbles in a glass of champagne, before breaking the drop’s surface and releasing microscopic particles, called aerosols which contain these oils dispersed in them, giving the rain its characteristic smell. Certain bacteria, particularly Streptomyces and Actinomyces, produce spores during very dry periods. The longer the soil goes without rain, the more the number of spores. The smell isn’t actually caused by the spores themselves, though. Rather it’s caused by a chemical excreted during the production of the spores known as “Geosmin.” Geosmin is an organic compound with a distinct earthy flavor. It is what gives beets that distinctive “earthy” taste. 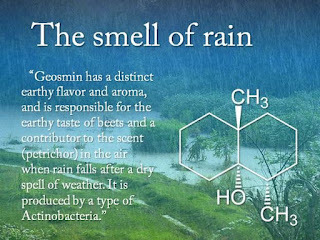 The human nose is extremely sensitive to Geosmin and is able to detect it at concentrations as low as 5 parts per trillion. If you’ve ever drank water that tasted “muddy,” but was otherwise seemingly clean, there is likely some Geosmin in your water. Ozone or O3 is made up of three oxygen atoms bonded together. An electrical charge can split oxygen and which then interacts with other oxygen molecules in the atmosphere to produce ozone. Ozone has a sharp odour. It’s unstable in the lower atmosphere, and is usually only found higher up – however, the downdrafts of wind produced by a storm can sweep it down from the higher atmosphere, making it possible for us to detect it, and giving the that ‘pre-rain’ smell. 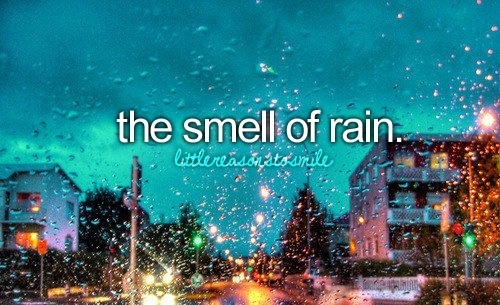 Studies reveal that the smell of rain can literally relieve stress and improve your mood by over 60%. The smell apparently is so powerful that neuroscientists came up with a perfume that matches it so the earthiness can also reap the benefits of the feel-good scent. Next time it rains try inhale the scent and brag about it that now you know the reason behind the aroma and your elated mood.